You can make anything from 3-D printing, from impossibly complex lamps to chain-mail bags to entire buildings. So it’s actually kind of surprising that 3-D printed shoes aren’t more common. Maybe someday soon: For her master’s thesis at ArtEZ in Arnhem, The Netherlands, Pauline Van Dongen created a line of high heels, dubbed Metamorphosis. The pieces were exhibited recently in a show in Amsterdam called “The Future of Fashion,” curated by Freedom of Creation, a Dutch outfit that specializes in 3-D printed design. 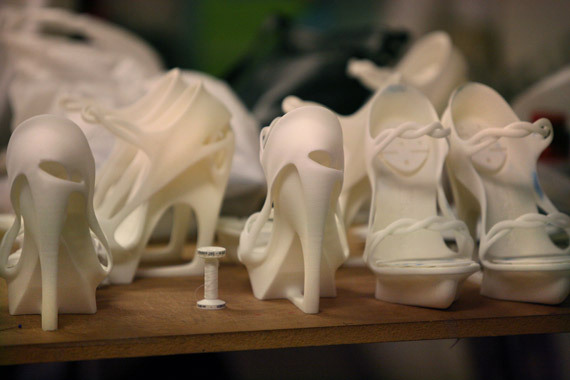 The shoes themselves are, like many 3-D printed objects, made of powdered nylon that has been slowly fused together, by a computer guided laser. As you can see on the heel and the forefoot, there’s a little bit of a platform flange–to give a bit of cushion on what’s normally a very stiff material. It’ll probably take a few more years though before you see 3-D printed shoes in your local mall: Even small objects like these can run thousands of dollars per copy, unless the designer happens to own her own machine. But these are dropping in price at a crazy rate: What used to be hundreds of thousands of dollars a few years ago can now be had by the at-home tinkerer for as little as $5,000.